FOXBOROUGH — Jimmy Garoppolo may someday be the successor to Tom Brady , but right now, the second-round pick is just trying to learn as much as he can, as quickly as possible. New England made Garoppolo and several other rookies available to reporters on the field at Gillette, but the former Eastern Illinois quarterback drew the biggest crowd. In other cities, drafted quarterbacks likely have a pretty good shot of challenging for the starting job. But in New England, Brady is still the starter. Though Bill Belichick acknowledged Friday night that Brady is getting up there in age from a football standpoint — he’ll be 37 Aug. 3 — and though Belichick, during his tenure in New England, has never drafted a quarterback so high before, the expectation is that Garoppolo will be sitting and learning for a couple of years. Thus far, his only interaction with Brady has been a brief introduction; veteran players and rookies are on separate schedules. It’s probably for the best. Garoppolo is focused on the playbook. “It’s a completely different offense [from Eastern Illinois], to be honest,” he said. “It’s like learning Spanish compared to English; it’s just a different language. But he believes he’ll be able to pick it up “very quickly, I think. It’s a process and I know there’s going to be a huge learning curve, but I’m excited for it. 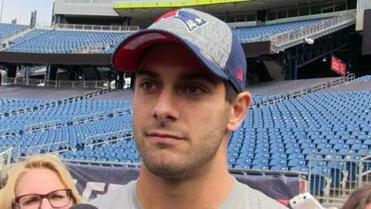 In addition to the sheer volume of the playbook, Garoppolo said another change will be working from under center. But whatever it takes — playbook study, film study, learning from Brady and Ryan Mallett — Garoppolo is ready. He called himself a blue-collar guy who likes to go to work every day. The last few days have been a whirlwind, but he calmly explained he won’t stress over everything suddenly thrust upon him. If anything has bothered him since getting the call that he was becoming a Patriot, it was having to leave his mother, Denise, on Mother’s Day to head to Massachusetts. His is a tight-knit “big Italian family,” he said, and Denise was a bit bothered to see her third of four boys head out. His big brother was part of one of the most-talked about plays in Patriots’ history, but Asa Watson will have to make his own memories with New England. The younger Watson, a 6-foot-3-inch, 237-pound tight end out of North Carolina State is one of several undrafted rookies signed by the Patriots. In that way, Asa is far different than Benjamin, who was a first-round pick in 2004. Asa said a few teams called about signing him after the draft, but the Patriots, who had worked him out on campus, showed the most interest. “It’s a great opportunity. I’m just very thankful that they would choose me as a free agent,’’ he said. A native of Rock Hill, S.C., Watson’s career with the Wolfpack was temporarily derailed when he had to undergo heart surgery after it was discovered he has Wolff-Parkinson-White syndrome, which causes the ventricles to contract prematurely. He had a second surgery and still takes medication, but it did not end his football dream. Watson has been at Gillette Stadium to watch Benjamin, but he was at home with family during the 2005 postseason when the Patriots traveled to Denver and Benjamin chased down Broncos’ cornerback Champ Bailey for a touchdown-saving tackle. “I was watching TV, sitting on the couch, and I thought the play was over and all of a sudden my dad jumps up and says, ‘Look at Benjamin! Look at Benjamin!’ He ran down Champ Bailey. It was amazing,’’ Asa said. Though New England has long featured the tight end position, Watson sounds as though he has no expectations. Shalise Manza Young can be reached at syoung@globe.com. Follow her on Twitter @shalisemyoung.